J. M. Golding is a photographic artist based in the San Francisco Bay area. She chooses plastic, pinhole, and vintage film cameras as her primary tools: plastic cameras such as the Holga for the playfulness and spontaneity they promote and their capacity to help create dreamlike images, pinhole cameras for their simplicity and their contemplative quality, and vintage film cameras for the subjectivity of the images that are possible. J. M.’s photographs have been shown internationally in numerous juried group exhibitions and she is the recipient of the 2013 Holga Inspire Award, Best of Show at Wanderlust (Dickerman Prints, 2017), the Lúz Gallery Curator’s Choice Award (2009), and several Honorable Mentions in juried exhibitions. J. M. Golding created and maintains 127 Film Photography, an online resource for community, inspiration, and information about 127-format film photography. All images and text on this site are copyrighted, © J. M. Golding ALL RIGHTS RESERVED (except for the images of "Tales from a non-existent land", see below). They may not be used in any way, for any reason, without my written permission. To request permission, please contact me. The images of "Tales from a non-existent land" are copyrighted, © Al Brydon and J. M. Golding ALL RIGHTS RESERVED. They may not be used in any way, for any reason, without Al Brydon's and my written permission. To request permission, please contact me. My work explores the emotional and symbolic significance of the natural world as it reflects internal, subjective experience. Through the photograph, the world outside the person illuminates processes deep inside us that may not be readily accessible to awareness. I often see multilayered aspects of inner worlds in reflection, shadow, and multiple exposure. I suspect that sometimes we know things that we don't realize that we know - this shows up in emotion, even if not in conscious knowledge of facts or events. These photographs contain transitions from outer landscape to inner, from objective landscape to subjective. They also embody the eye’s transitions across the scene, moving incrementally from one perspective to another. Square frames of film that are normally separate join together to form new, integrated images, wholes that are greater than the sum of their parts, transcending the literal separation of the component scenes. Because the multiple, overlapping exposures used to create these photographs are made sequentially, as compared to the single moment typically seen in photographs, the series of exposures portrays transitions in time from one moment to the next. Although the time and distance traversed are small, the transitions across them create surprising changes in what is visible. These images address preverbal experience that is retained, perhaps in the unconscious, long after it has become possible, expected, and maybe even typical to relate to the world largely through words. The photographs speak of pure actuality, that moment before verbal labels rush in to change experience … of the moments between sleep and waking, dreams vanishing as the dreamer wakes … of matter coming into form, possibilities for transformation … of unwished wishes and unspoken memories … of moments seeking resonance, concepts in the process of forming, hopes and dreams being nurtured carefully and sent forth. One autumn, fire ravaged over 3,000 acres of mountain wilderness in northern California. Photographs of the burn area show the bleakness and devastation that remained, a landscape of loss. There are subtle signs of hope, easy to miss, and perhaps requiring more interpretation than is justified. Seemingly against all odds, the following spring brought rare wildflowers to the area. Known as “fire followers,” these flowers only grow in the aftermath of an exceptionally hot fire, occurring perhaps once or twice in a person’s lifetime. Where there had been desolation, there was now joy – mirrored in this unique, if ephemeral beauty that could only come into existence because of destruction. 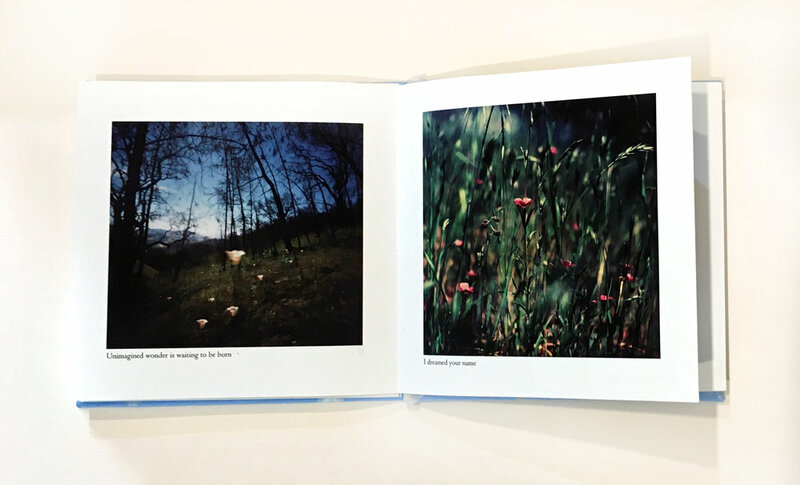 Fourteen photographs from From destruction grows a garden of the soul are available as a limited-edition, handmade, accordion-fold book. A collaboration with UK-based artist Al Brydon. We each expose a roll of film in a plastic Holga camera, send it to the other, and re-expose it - not knowing what already present in the latent image. Using the random magic of two unconscious processes and two Holgas, we combine the Peak District with northern California in often unexpected ways, creating a land that will never exist ... and yet, manifestly exists in our photographs. These photographs are about the integration of loss, co-creation enduring in the overlap of images. The technique was inspired by Paul Romaniuk's series, That summer at the lake.